Description:- A richly inventive novel about a centuries-old vampire, a spellbound witch, and the mysterious manuscript that draws them together. Review:- I thoroughly enjoyed this book. It has magic, mystery and romance, everything I would want in a novel. This is a strong debut. The start was a little slow, building up the setting, but it’s worth the wait. Deborah is an amazing writer, she has done her research well. Her imagination, along with her historical knowledge is immense. She weaves in parts of history like the Salem Witch trials and Olde England to give the story depth and realism. Diana is a strong, self-reliant woman who is a witch but wants nothing to do with magic. She has been stubbornly determined to not use her magic since a tragic event from her past. She is likeable and you can relate to her. Other than humans Diana’s world is populated by three other species – witches, vampires and daemons. All of whom you will get to meet. Especially a very suave vampire. She discovers a lost manuscript, Ashmole 782, after which she meets scientist Matthew Clairmont. Matthew is a Vampire and highly respected within the University. She is drawn to him, unsure why are first then she is plummeted into an adventure that is full of romance, desire, magic and ancient orders. Diana must discover the depths of her power to decipher the secrets of the book and protect herself and those she loves. This is a highly addictive read, don’t let the whopping page count put you off. The cliffhanger at the end, what can I say…. When’s book two out? 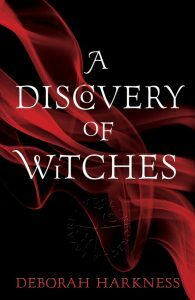 I would recommend A Discovery of Witches, it’s an enthralling read, which will leave you gasping for more. Check out the Website here and find out if you are a witch, demon, vampire or a human. I’m human, not my ideal choice but who can argue with the quiz. I was sent this book from Headline Publishing in exchange for an honest review. Thank you Headline I really enjoyed this. This book sounds awesome! Thank you for introducing me to it! I love when paranormal authors weave in history — especially the Salem Witch Trials. I'll have to check this one out!